The United States Army has met an unusually complex challenge in Southeast Asia. In conjunction with the other services, the Army has fought in support of a national policy of assisting an emerging nation to develop governmental processes of its own choosing, free of outside coercion. In addition to the usual problems of waging armed conflict, the assignment in Southeast Asia has required superimposing the immensely sophisticated tasks of a modern army upon an underdeveloped environment and adapting them to demands covering a wide spectrum. These involved helping to fulfill the basic needs of an agrarian population, dealing with the frustrations of anti-guerrilla operations, and conducting conventional campaigns against well-trained and determined regular units. As this assignment nears an end, the U.S. Army must prepare for other challenges that may lie ahead. While cognizant that history never repeats itself exactly and that no army ever profited from trying to meet a new challenge in terms of the old one, the Army nevertheless stands to benefit immensely from a study of its experience, its shortcomings no less than its achievements. Aware that some years must elapse before the official histories will provide a detailed and objective analysis of the experience in Southeast Asia, we have sought a forum whereby some of the more salient aspects of that experience can be made available now. At the request of the Chief of Staff, a representative group of senior officers who served in important posts in Vietnam and who still carry a heavy burden of day-to-day responsibilities has prepared a series of monographs. These studies should be of great value in helping the Army develop future operational concepts while at the same time contributing to the historical record and providing the American public with an interim report on the performance of men and officers who have responded, as others have through our history, to exacting and trying demands. All monographs in the series are based primarily on official records, with additional material from published and unpublished secondary works, from debriefing reports and interviews with key participants, and from the personal experience of the author. To facilitate security clearance, annotation and detailed bibliography have been omitted from the published version; a fully documented account with bibliography is filed with the Office of the Chief of Military History. The author of this monograph, Major General William Fulton, was intimately involved in the early development of the riverine warfare concept as commander of the 2d Brigade, 9th Infantry Division, which arrived in Vietnam in January 1967 and immediately began combat operations in the Mekong Delta. In March the brigade moved into Dong Tam, the base created by dredging sand from the bottom of an arm of the Mekong River. In early June the brigade teamed with Navy Task Force 117 to form the Mobile Riverine Force. During World War II General Fulton fought in Italy and during the Korean War served on the staff of Army Forces Far East Advance. He is presently the Director of Doctrine Evaluation and Command Systems in the Office of the Assistant Chief of Staff for Force Development and is also Systems Manager for Surveillance, Target Acquisition, and Night Observation Systems. 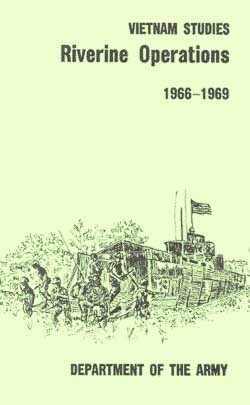 This monograph describes U.S. Army Riverine planning and operations in the Republic of Vietnam during the years 1966 through 1969. Since the personal experience of the author was with preparations for riverine operations and the initial operations themselves, emphasis has been placed on these activities through early 1968. In summarizing operations conducted in the balance of the three-year period, particular attention has been called to significant trends or changes in riverine operations in Vietnam, a co-operative enterprise of the U.S. Army and the U.S. Navy. Looking back from the vantage point of early 1972, this study attempts to reconstruct the events and describe the situation as it was from 1966 through 1969, using official records, reports, and personal interviews. The author is indebted especially to the officers of the 9th Infantry Division who helped in the research and writing of this monograph. Major Johnnie H. Corns was initially the intelligence officer and later the operations officer of the 2d Brigade during 1966 and 1967. His research, writing, and continuous editing have been indispensable in preparation of this study. Colonel Lucien F,. Bolduc, Jr., commanded the 3d Battalion, 47th Infantry, and was later operations officer of the 9th Infantry Division during preparations for and initial conduct of riverine operations. His contributions in preparing the 2d Brigade of the Old Reliables for these operations and in preparing this manuscript are fully appreciated. Colonel Thomas C. Loper, 9th Infantry Division Engineer in 1967 and 1968, contributed both in the enactment and the recording of the riverine story. The author also wishes to acknowledge the typing assistance of Miss Ann Faherty and Miss Judith A. Secondo, who patiently saw the manuscript through several drafts.